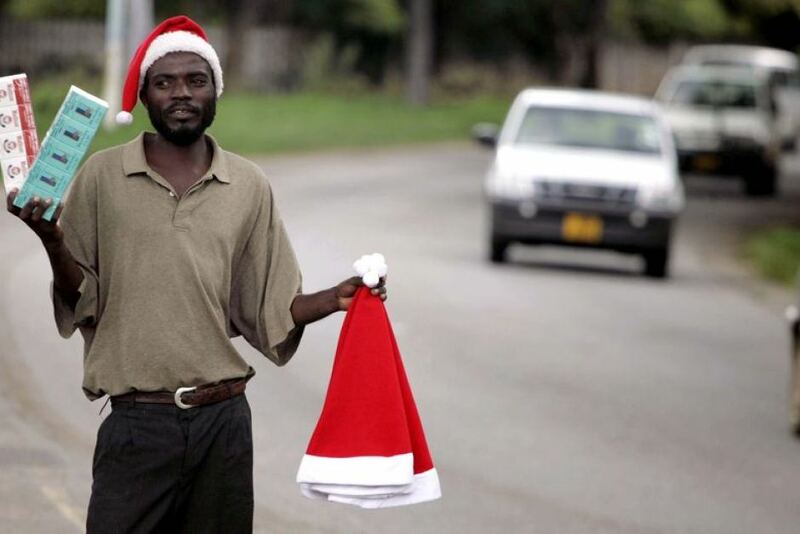 It has been a very busy year so far for David and Martha Holman and their charity Love Zimbabwe. David and Martha moved to Gilwern, Wales in April and have been busy planting lots of organic vegetables! 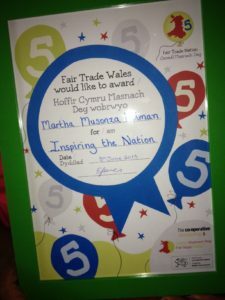 Fair Trade Wales Award for Inspiring the Nation. The charity raises money for essential projects in rural areas of Zimbabwe such as boreholes for fresh water, improving medical services at their local clinic in Domboshawa and establishing an area of community land where local people can grow food and work in the workshop built there last year. The workshop was constructed by David and Martha last November with funding from the Castle Street Methodist Church. It has been used primarily by the mothers of disabled children group to make batiks. In June the couple were guests at the Fairtrade Wales conference in Swansea where Martha was given an award for ‘Inspiring the Nation’ for her work with Fairtrade Wales. 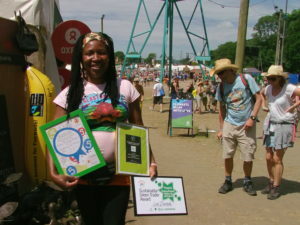 Martha with her awards at Glastonbury. Following this they took their 2 year old daughter, Tanaka, to Glastonbury where they set up a large stall selling fairly traded arts & crafts from Zimbabwe. Fortunately the weather was fine and a good amount of money was raised. Another award was presented here for sustainability and the people’s choice for the best stall at Glastonbury. 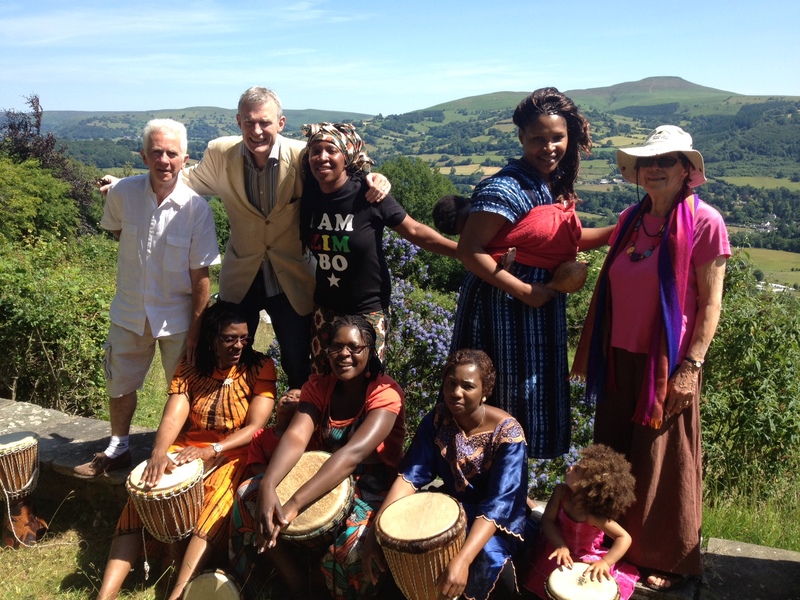 Dave & Martha with Jeremy Vine and ZimVoices, Gilwern, Wales. Soon after this Martha received a phone call from BBC Radio 2 asking whether she would like to tell her life story as part of a new series on the Jeremy Vine show which comes out at the end of September. 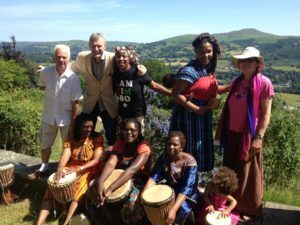 Jeremy Vine visited David and Martha at their home and spent all day there recording the programme. During our annual visits to Zimbabwe between 2007 and 2010, we have donated medical supplies, water purifying tablets, a large number of wheelchairs and numerous suitcases of clothes and shoes. British Airways have supported us by waiving the extra baggage charges when we’ve flown with them to Lusaka, Zambia, so we were able to take these essential goods for the community. In 2009 we delivered 400 kilograms of medical supplies to the area during the cholera epidemic, which claimed many lives. This medication helped to save many more lives during that period. In addition the clinic and a locally based doctor, were able to hand out condoms and antibiotic drugs to individuals, ensuring that they are able to protect themselves against the threat of HIV and Aids and this has prevented many premature deaths. We continue to collect medical equipment, clothes and basic sanitary essentials and send them all year round by post. Dr Mbambe, St James Clinic, Chinamhora. A key project that was sponsored by the charity in 2009, was the drilling of a bore hole – the community’s only water supply – which is essential to everyone. It meant that the clinic was able to operate, saving lives and the whole village has water to survive. The charity still relies on funds to maintain all water projects in Zimbabwe. We are keen to find volunteers to sponsor and fundraise for water projects specifically. During our annual visit in 2012, we funded the work to lay water pipes so another part of the Chinamhora community can be connected to the municipal water supply. This is quite a distance from the borehole and was essential to provide a basic human resource to more remote parts of Zimbabwe. Between September 2009 and November 2012, Love Zimbabwe Charity completed a sanitation project to put flushing toilets and bathrooms into the nurses homess and the maternity room for Chinamhora Clinic. Prior to this, there were no washing facilities at all. 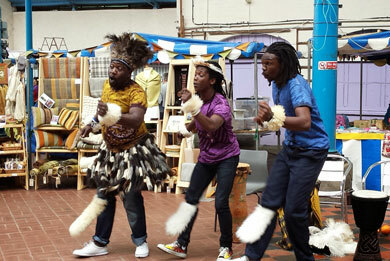 Our main project has been the building of a workshop for the arts and crafts producers in the community. They need space to work, access to running water and space to store their products. The site was completed in 2012 and has now been painted with murals. This is a huge step forward for the community producers and is already in full use. The great thing about our centre is that everyone accesses it. The community spirit is incredible and we rely on the mothers of disabled children to hoe the grass and maintain the landscape. Taurai Sinaro, our charity trustee based in Zimbabwe, is now temporarily occupying one small room in the workshop for security, and to manage the use of the workshop with our producers. He will also be managing various food-growing projects on the land. If you wish to see our projects first hand please contact us and we can arrange a tour of the centre.